An English Homestead: What's Your Best (or Worst) Bread Making Mistake? "Something wrong with your bread I need to go buy some for lunch." 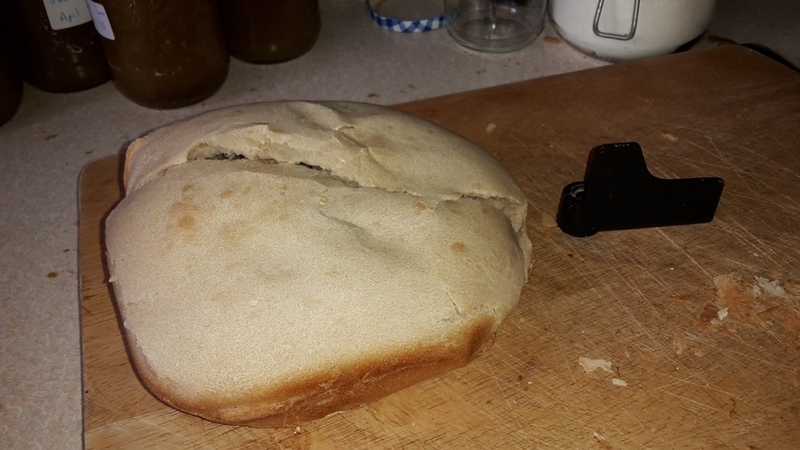 I went in and saw my "loaf", I knew what had happened, as I was putting it all in the bread maker one of the girls had asked me a question and I forgot to put the yeast in. Although it was a annoying it was quite funny as I think you could knock someone out with that loaf. It reminded me of the time I forgot to put the paddle in for stirring, so when I came to eat my lunch there was just a bowl of burn flour! So it got me wondering if anyone reading his has any stories of bread failing to do what it's meant to or doing something unexpected? I'd love to here your stories! yes there has been disasters, put in the Rayburn and forgotten about as you cant smell anything cooking in the Rayburn, now set a timer on my phone, set to prove forgotten about and it has risen given up and collapsed in on itself, undercooked in the middle when the outside looks great, I do now get bread on the go when we are down to quarter of a loaf so if it goes wrong which to be fair isnt very often these days I can always throw another together. I once put the dough to rise in the fridge overnight, then forgot about it until late the next day, by which time it had risen and risen and risen and moved and wandered over the three fridge shelves beneath it. Took ages to clean up. I now put a heavy lid on the bowl so the dough stays put to stop such shenanigans happening again! Yes, I've done both those things, forgot the paddle, forgot the yeast, even forgot the water one time! I usually make bread by hand, I find the kneading very theraputic! Even making it by hand it's easy to make silly mistakes; I've made it without salt once. I threw it out on to the garage roof for the birds, but even they wouldn t touch it! Was the bread still good to eat. Some people make bread with no yeast on purpose don't they? GF sourdough is proving almost a step too far for me, just about given up for now. Have now got normal gf bread just about right but tends to crumble a little after being thawed. My lovely daughter made bread in the bread machine for my husband and I to take on a date night. It looked and smelled beautiful but tasted awful! She had forgotten the salt! My worse problem is that I occasionally leave it proving for far too long and it gets ENORMOUS, and then when you do go to move it it simply collapses in on itself. The first time I did this I just went ahead and baked it, now I knock it back completely and let it prove again, it works.